There are several ways to go to Agile @ Scale. The Net Objectives portal offers support for the three most popular approaches. SAFe® is quickly becoming the de facto standard for Agile at Scale. But at the same time it’s become more complicated to use. The SAFe page looks at SAFe through a different lens, enabling it to be better understood and enhanced as needed. View the SAFe page on the portal and view our services. FLEX is our operating model which we use to work with popular frameworks and our own methods that have proven to be useful. FLEX can create a completely tailored approach, be used in its standard configuration or be used to support other methods such as SAFe. View the FLEX page on the portal and view our services. Initial training and coaching is not enough. And for most organizations, a program of ongoing training is too expensive. 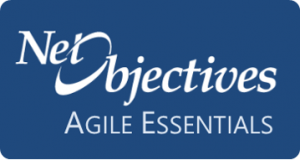 Net Objectives Agile Essentials is a set of support documents, online training and support services that enable a Community of Excellence to function more effectively and efficiently. View the Net Objectives Essentials page on the portal and view our services.